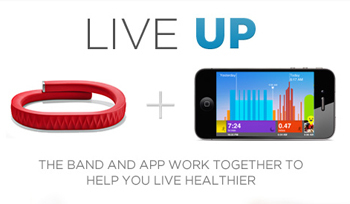 A few months ago we first heard about Jawbone’s new revolutionary health and fitness offering, Up, which is essentially both an app and a wristband, which “tracks your activity and sleep and inspires you to move more, sleep better and eat smarter” according to the launch email we received this morning. We’ve seen plenty of health and fitness gadgets and apps recently, but the Up is different because it tracks EVERYTHING, from the calories you’ve burned and the steps you’ve taken throughout the day to the amount of deep sleep you’ve had and the meals you’ve eaten. There are then many different ways to keep a record of everything, share it with your contacts and even set yourself goals for the future. The bracelet and app don’t just track your activity either, you can set yourself reminders and even a morning alarm, which means the bracelet gently vibrates on your wrist. When it comes to the bracelet itself, it’s been specially designed to not irritate you throughout the day, it’s durable, light, sweat-proof, water resistant and comes in a few different colours. It speaks to the app via an audio jack hidden at the end under a little cap. Obviously it’d be great if it didn’t require you to hook them together like that manually, but the bracelet’s not that clever. Not yet anyway. I imagine there’ll be sceptics who don’t want to feel like they’re living every second of their lives through a colourful bracelet, but we use so many separate apps and gadgets to track things and give us advice, the Up system seems like the next logical step. A few early reviews are picking holes in the sharing aspect of Up, suggesting that the fact you can’t link your data with Twitter and Facebook just yet is a big negative. I imagine that kind of integration will come very soon, but for now I quite like the fact that our health and fitness information is kept private, sure some people like to brag or like to be spurred on by their social networks, but at the end of the day improving your health and fitness needs to be a personal goal if you’re going to stick with it in the long run, not just so you can tell your Facebook friends all about it. We can’t wait to get our hands on an Up bracelet to try it out for ourselves, so check back in the next few weeks for a full review. Available from a number of online retailers for $99 (we’re trying to find out if it’s available in the UK too). I picked mine up on Sunday, and I love it. It’s very comfortable, to the point that I don’t even notice I’m wearing it. I don’t know how it knows that I’m taking a step versus just swing my arms, but I find that it’s quite accurate even if I’m walking without swinging my arms (although some arm movement is necessary). The coolest feature so far is the sleep. I love to plug it into my iPod the next day and see what my sleep was like the night before. It uses a bar chart to show when you in deep sleep, versus, light, versus slightly awake and moving around. Plus you can download challenges and work on those. I currently am working on the 10,000 Steps in 10 days Challenge. You get points when you complete one. I don’t know what the points are for. it’s a great little device. they’re a little impossible to find right now, but if you can find one, GRAB IT!